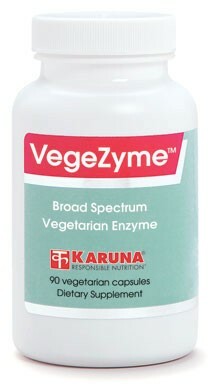 VegeZyme is a plant-based source of digestive enzymes as an alternative to PancreMax or DuoZyme. Plant enzymes exhibit potent activity in a broad pH range. Bromelain complements other proteolytic enzymes derived from non-animal sources. Lactase improves digestion of dairy foods. Cellulase, phytase, and alpha-galactosidase break down other poorly digested carbohydrates. 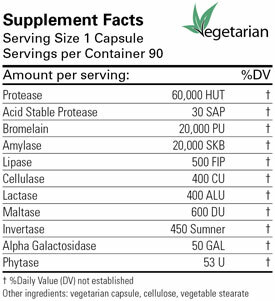 With additional lipase and other valuable enzymes, VegeZyme offers a potent plant-based combination of a broad spectrum of enzymes needed for normal digestion. Non-animal derived enzymes are generating significant interest as alternatives to traditional pancreatic enzymes (Pancreas 2003;26:1-7; Pancreas 1992;7:311-9). Lactase, such as contained in VegeZyme, supports normal digestion of dairy products when taken simultaneously (Pediatrics 1987;79:766-72). Alpha-galactosidase effectively breaks down potentially gas-forming carbohydrates (Clin Ther 1998;20:497-504). Suggested use for adults: 1-2 capsules with each meal, or as directed.